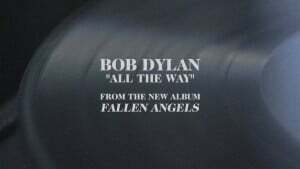 “All the Way” is the second song released off the album Fallen Angels out May 20. Both “All the Way” and “Melancholy Mood” are available instantly with all digital pre-orders of the album. The track can also be streamed below and on Apple Music. Pre-order Fallen Angels on iTunes, Amazon, Google Play and at Barnes & Noble. For exclusive bundles with limited edition lithographs, head to the Bob Dylan store.